Hello everyone, today you will be able to download Windows 10 Pro for Workstations through the official Microsoft Store at a click of a button. Windows 10 Pro for Workstations is a newer and much more powerful version of Windows 10/Windows 10 Pro and it mostly aimed at small, medium and enterprise sized companies. We bought this newer windows version for our 3 HP computers here at Oxavi Group Inc and so far we love it, it is as advertised. Today we will highlight a newer, stable and more powerful version of Windows 10 targeted at mostly companies known as Windows 10 Pro for Workstations. This new version brought to you by Microsoft themselves is fresh and it is less than a year old. If you have a powerful high-end PC with up-to date hardware, this is a Windows version you might want to take a look at, even if you are an individual and not necessary a company. Either way, check out the features of Windows 10 Pro for Workstations and let us know in the comments what you think. It is worth it to try? We think so but we want to hear your thoughts and ideas. What Is Windows 10 Pro For Workstations? Windows 10 Pro for Workstations utilizes significant investments, that Windows has made in recent releases, for scaling up across a high number of logical processors and large amounts of memory. Our architectural changes in the Windows kernel take full advantage of high-end processors families, such as Intel Xeon or AMD Opteron, that package a high number of cores in single or multi-processor configurations. Expanded hardware support: One of the top pain points expressed by our Windows Insiders was the limits on taking advantage of the raw power of their machine. Hence, we are expanding hardware support in Windows 10 Pro for Workstations. 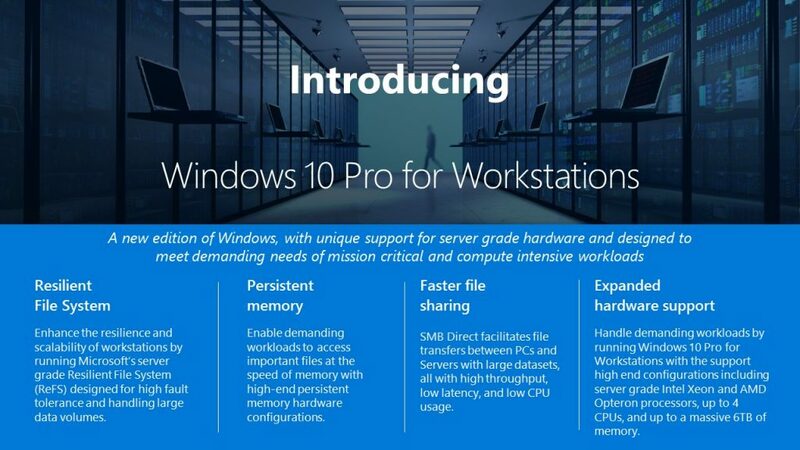 Users will now be able to run Windows 10 Pro for Workstations on devices with high-performance configurations including server-grade Intel Xeon or AMD Opteron processors, with up to 4 CPUs (today limited to 2 CPUs) and add massive memory up to 6TB.